Maple Mustard Bacon Chicken Skillet where the chicken comes out super tender and the creamy sauce is to die for! This easy chicken dinner recipe is full of flavor and will become a new family favorite! Are you guys ready for this one? This is one SERIOUS dinner right here. Life has been so hectic lately that I haven’t had a chance to experiment much in the kitchen. It’s pretty sad. I make the same quick and easy meals over and over again. While I love those meals, I need to get back into a good routine of doing some exploring in the kitchen. I need some motivation! 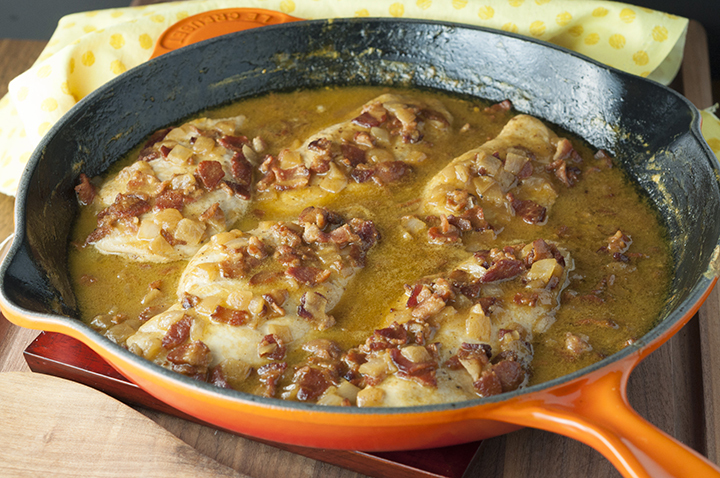 If you’re anything like me, I have this Maple Mustard Bacon Chicken Skillet to share with you today to get you putting some new and fresh meals on the table for your family. 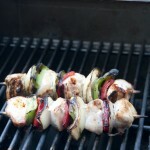 Have you tried my Spicy Chicken Riggies yet? I just spent four days in D.C. with Mr. Wishes for a little Valentine’s Day weekend getaway. We don’t do much on the holiday itself, especially when it falls on a day right in the middle of the week. We stayed home and cooked dinner together (steaks on the grill, sweet potatoes, and a spinach salad on the side.) This weekend in D.C. we hit up all of our favorite restaurants (Hillstone, Rasika) and went to see a show at the beautiful Kennedy Center. Our friend Ramin was starring in the show “Chess” and we wanted to make sure we saw it before it was over since it was only a 5 day show. It was amazing! We even got to hang out at the closing reception with the cast on their last night and meet some other members of the cast. We also did some new things we have never done before like visit the Museum of the Bible – a museum in Washington D.C. which documents the narrative, history and impact of the Bible. We also went to the National Air & Space Museum which was awesome. The best part? Both of those museums are free of charge. It’s nice to see fun things people can do with their whole family without having to pay. 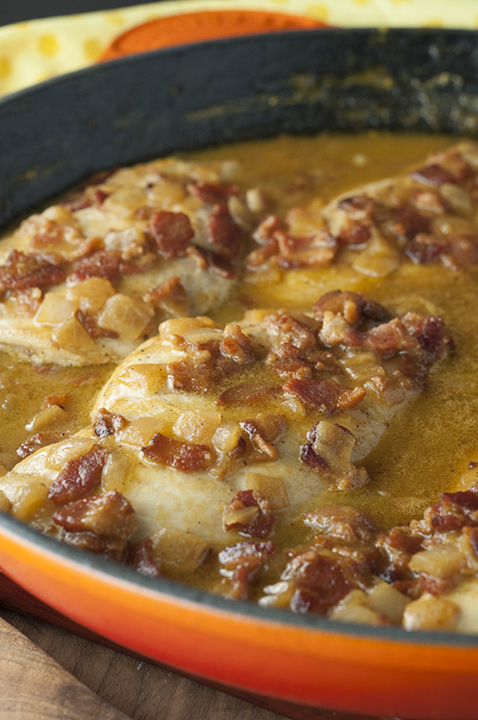 The sauce on this Maple Mustard Bacon Chicken Skillet is creamy with so much flavor. If you eat it with a spoon I won’t judge you. The chicken came our surprisingly tender and there were minimal dishes to clean when all was said and done. Plus, can you really go wrong with bacon?! It’s one of my new favorites – right up there with my Cheesy Chicken Sausage Pasta Skillet. 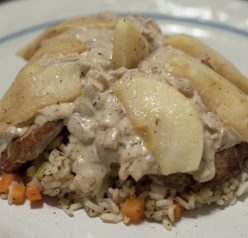 If you’re looking for ideas, serve this dinner recipe over rice, pasta, or enjoy it by itself with some delicious sides! Enjoy! 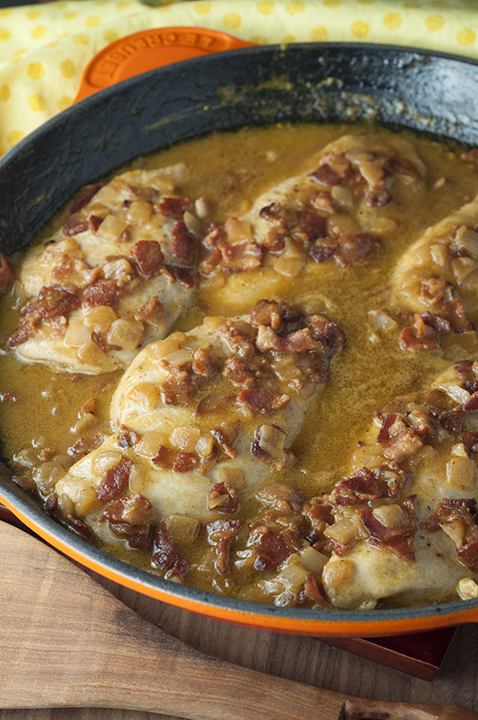 Maple Mustard Bacon Chicken Skillet recipe where the chicken comes out super tender and the creamy sauce is to die for! This meal is full of flavor! Mix together the Dijon mustard, paprika, salt and pepper in a small mixing bowl; combine to make a paste. Spread this paste onto each side of chicken breasts. Set aside. In a large skillet, cook your chopped bacon on medium-high heat just until browned. Remove wiht a slotted spoon/transfer to a plate, but don't drain the bacon grease. To the same skillet with the bacon fat, add chopped onion and cook until translucent. Remove to the same plate where you put the bacon. Add the olive oil to the hot skillet. Cook your coated chicken breast on medium heat, about 2 minutes on each side. The chicken will not be done yet - you will continue cooking it in the next step. Remove chicken to a plate. To the same skillet, add your chicken stock and maple syrup, bring to boil, scraping the bottom of the pan to get that flavor into the chicken stock mixture. Add bacon and onions back to skillet and mix together. Add the chicken breast back to the same skillet, reduce the heat to low-medium and cook for about 15-20 minutes, turning chicken once for even cooking, until chicken breast is fully cooked and no longer pink in the center. Wow! This looks so scrumptious! I bet it would go great with a side of roasted sweet potatoes and a side salad with honey mustard dressing. On my to cook this week list, thank you! This look right up maybe alley! Putting it on my list to try. We love all of the interesting things you can see and do for free in D.C. (why not enjoy what you pay taxes to support?). Sounds like you had a great trip. I would love to see a show at the Kennedy Center someday. Just want to let you know that I made this dish AGAIN last night and my husband and I just raved about it. Since there are only two of us, I bought one NY boneless, grass fed steak (almost 1 lb) and followed the instructions to the T, although I used avocado oil instead of vegetable oil. Unbelieveably easy. You really have to be illiterate to mess it up. Also, instead of a cast iron skillet (of which I have all sizes), I decided to try this recipe on my electric skillet (one of these new copper ones that I just received as a gift). The steak came out just absolutely perfect. Seared on both sides and the wine sauce is OHG awesome. I used a medium-bodied Cab. The wine reduction was super easy and placing the butter and broth at end was just the right touch to make it terrific. How can I thank you enough?? Thank you from both of us. 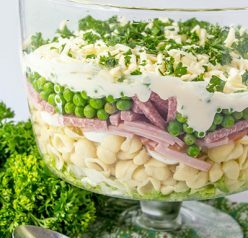 This recipe is not only a keeper, but will be served to guests to impress them with my “5-Star Restaurant in my kitchen. Best compliment of the day! Thank you so must, Kirsten!